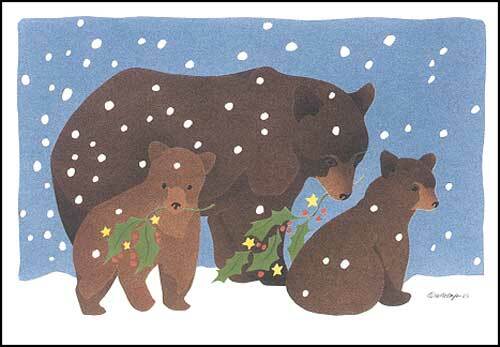 Crane Creek Graphics Christmas card featuring a mother bear and her two cubs. The bears hold holly boughs in the mouth as snow softly falls. Inside note reads "May you have a Happy Holiday and a Joyous New Year." Set of 10 cards with envelopes. Printed on 100% recycled acid-free paper. 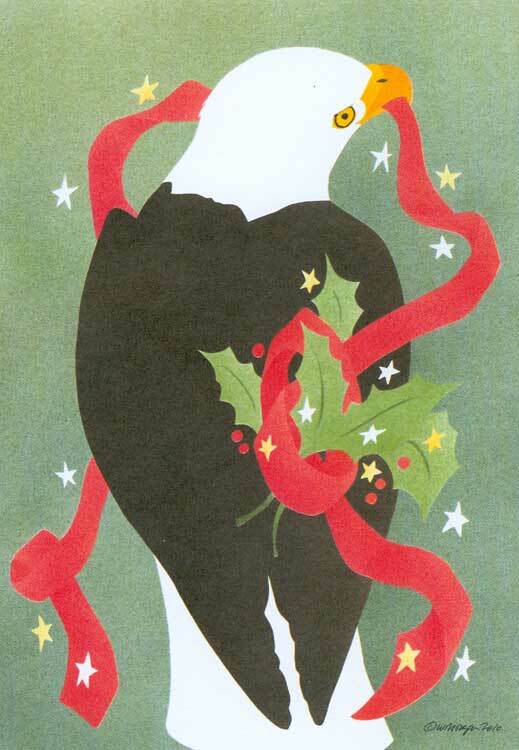 Holiday card featuring a bald eagle holding a red ribbon with holly leaves. Inside note reads "May you have a Happy Holiday and a Joyous New Year." Set of 10 cards with envelopes. Printed on 100% recycled acid-free paper. 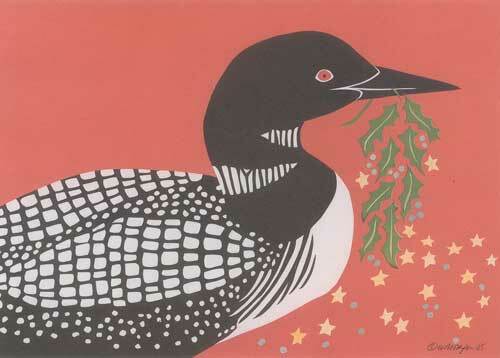 Holiday card featuring a Common Loon holding a holly bough with stars and berries drifting below. Inside note reads "May you have a Happy Holiday and a Joyous New Year." Set of 10 cards with envelopes. Printed on 100% recycled acid-free paper. 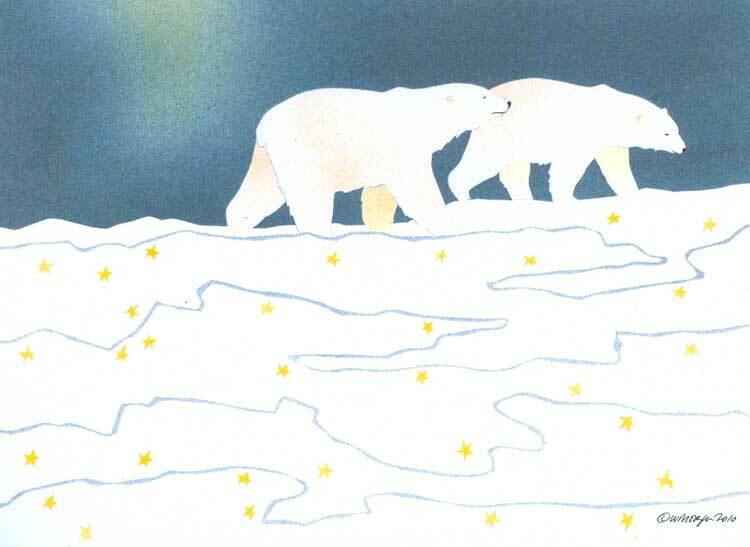 Holiday card featuring a pair of polar bears walking on snow decorated with golden stars. Inside note reads "May you have a Happy Holiday and a Joyous New Year." Set of 10 cards with envelopes. Printed on 100% recycled acid-free paper. 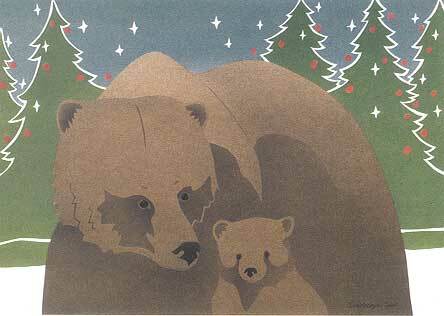 Holiday card featuring a Grizzly bear and her cub against a backdrop Christmas trees. White stars twinkle in the sky and the trees are adorned with subtle red balls. Inside note reads "May you have a Happy Holiday and a Joyous New Year." Set of 10 cards with envelopes. Printed on 100% recycled acid-free paper.